Hiroshima is in the west part of Japan. 4 hours from Tokyo by Shinkansen(bullet train) and 90 minutes from Osaka. 6.5 hours by bus from Osaka. 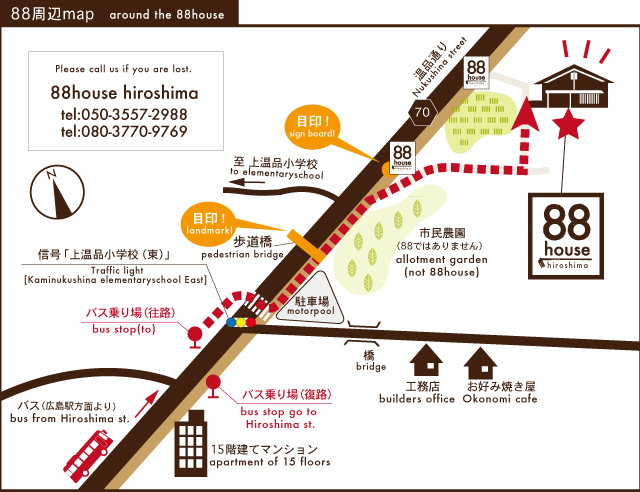 Although 88house is a bit out of the city, it has easy access to the city center and the main station. It is 25 minutes by bus from JR Hiroshima Sta. It is also 7 minutes away from Hiroshima-Higashi Interchange of Sanyo Expressway. It takes about 25 minutes from JR Hiroshima Sta. by bus(280 yen). Get on #29 bus from both exit of JR Hiroshima Sta. 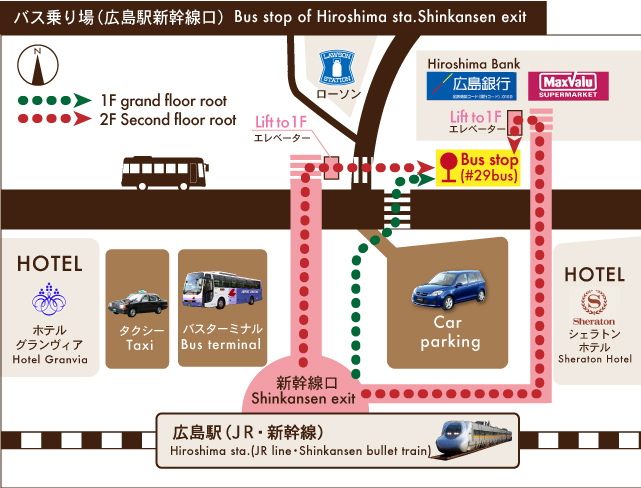 or Hiroshima bus center(40 min) near Peace memorial park. at Kami nukushina Shogakko(KaminikushinaElementary School. This link is how to ride the bus in Hiroshima. Go outside of the station, then you will see Hotel Sheraton on your right. Get off at “Kaminukushina Syogakou Iriguchi” Better to ask bus driver when you get on. #29 bus usually goes every 10 minutes. Last bus is 11pm from the city center. 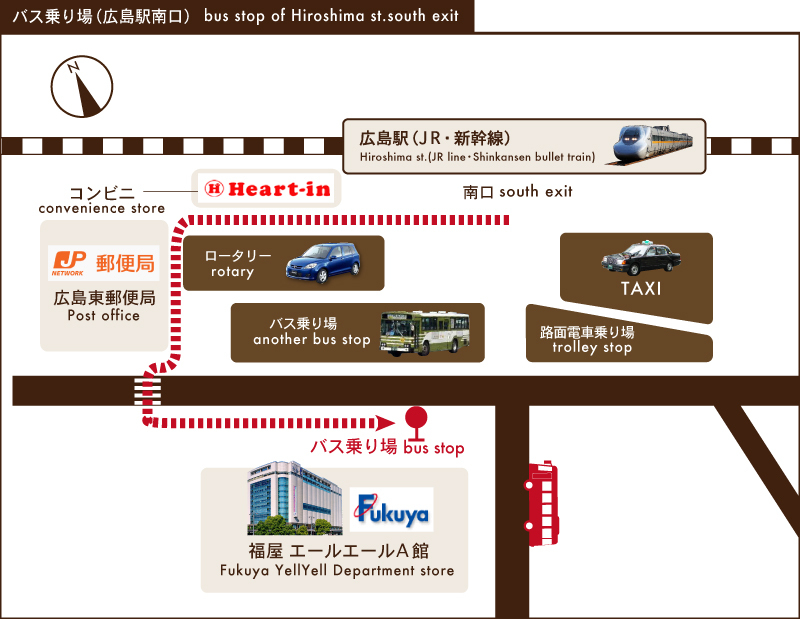 The bus stop is at the main entrance of Fukuya ale ale department store. If you take underground street from the station,exit #7 then, you will see the #20 bus stop at the entrance. 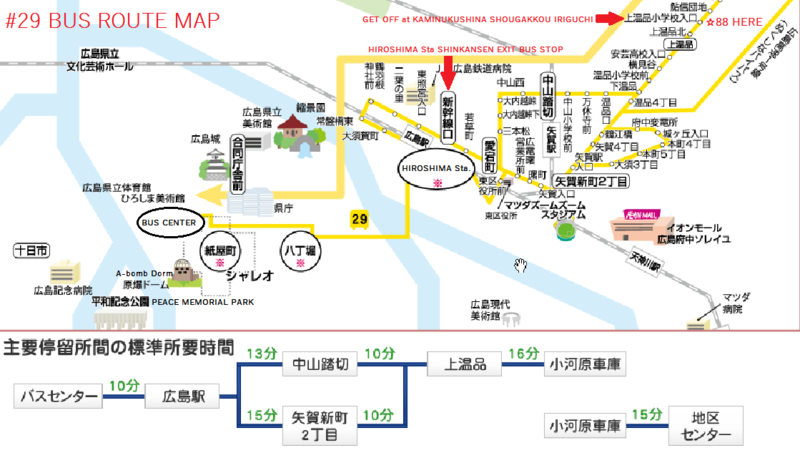 Get on #29 bus to “Kaminukushina Syogakou Iriguchi”(上温品小学校入口) Takes about 25 to 30 minutes. Better to ask bus driver when you get on. It is in the 3rd floor of Sogo department store few minutes walk from Peace memorial park. Get on #29 bus to “Kaminukushina Syogakou Iriguchi”(上温品小学校入口) Takes about 35 to 40 minutes. Better to ask bus driver when you get on. It is about 3 minutes walk from the bus stop. Cross the street and walk toward to pedestrian bridge. Pass the pedestrian bridge underneath, you will find 88 signboard Go into 88 area on your right side. you will see 88 house and signboard from there. *the bus is usually crowded at rush hour (8~10, 17~19). If you have large luggage, you would better skip the rush hour. *JR Hiroshima Station and Bus center have a coin locker to keep your luggage. You’ll reach 88house about 7 minutes from I.C. my phone number is not fits the GPS. Please put this number into GPS. Print this below for taxi driver.